The Casper mattress is excellently built and functions to support your body on its own. However, you’ll still want the best bed frame for Casper. The frame that you place it on has as much of an effect on the quality of your sleep as the mattress does! If you own a Casper mattress and are looking for a frame that will maintain the quality of your bed, here is a short guide that will help. Now that you have a better idea of what you should be looking for when you are shopping around for a bed frame, here is a list of some of the best bed frames on the market that are compatible with your Casper mattress. The Zinus Ironline Metal and Wood Platform Bed with Headboard is one of the more highly-recommended bed frames that is compatible with the Casper mattress. The frame of the Zinus Ironline Metal and Wood Platform Bed with Headboard is approximately 7 inches tall and features a wood slat support system to help handle the weight of your mattress and prevent the frame from wearing down over time. This frame also features padded foam tape and non-slip tape applied to the frame and under the wood slats to reduce noise and possible movement resulting from constant use. The Zinus bed frame also comes with a wooden headboard that matches the wooden slat design at the bottom. Overall, this is a well-built bed frame for the Casper mattress. The steel frame is very supportive and the wood slat design keeps the mattress upright without damaging the frame itself. The noise reduction and no-slip tape features work really well and deliver the quality that is advertised. In addition to the quality build, the design is aesthetically pleasing and is perfect for almost any bedroom design. 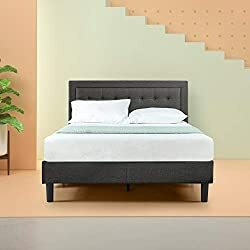 If you are in the market for a bed frame that looks good and is built well-enough to enhance your Casper mattress experience, the Zinus Ironline Metal and Wood Platform Bed with Headboard bed frame is definitely one you should consider, especially if you’re really looking for a metal frame. This frame is also popular with Tuft & Needle and Purple mattresses. The Flex Form Arched Platform Bed Frame is a one-of-a-kind steel bed frame that focuses on total body support with its unique build. 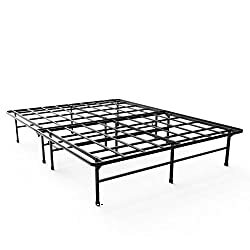 This bed frame is constructed from heavy-duty steel and features two arches at the sides of the bed frame to help support the mattress along with a central leg section that prevents the middle from sagging down into the frame itself. Since the body is made of steel and is designed with support in mind, there is no need to purchase a bed frame to prop up your Casper Mattress and you won’t have to worry about noise coming from your frame during use. In addition, this frame is capable of supporting up to 1,200 pounds of weight. The Flex Form Arched Platform Bed Frame is extremely well-built but there have been some issues reported by customers. Some of the users of this bed frame have complained that the frame itself does squeak over time and that the frame is so light weight that it shifts around easily and needs to be rearranged after each use. However, these concerns do not seem to be a common problem. While the Flex Form Arched Platform Bed Frame is not the most aesthetically pleasing option on the market, it is certainly a very sturdy option for those who prefer support over looks. Another product offered by Flex Form, the Flex Form Raised Platform Bed Frame is a great option for those who want a supportive frame without all the hassle that typically comes along with setting it up. This bed frame has a design that looks similar to two joined folding tables and only takes minutes to set up. The body of this frame is made out of anodized steel and will provide a quiet and stable base for your bed. Because this frame includes a middle section, there is no need to worry about your Casper mattress sinking into the center of your frame. This sturdy frame is able to support much more weight than the previous frame with a maximum capacity of 2,500 pounds. Although this is a simpler bed frame, very few people have had an issue with the quality of the frame itself. The only thing that could be considered a problem with this frame is that the mattress has been known to slide a bit on occasion. Other than that minor issue, the Flex Form Raised Platform Bed Frame is an easy-to-use bed frame that would work well for almost anyone. For people who prefer solid platforms and can skip out on the extra storage space, the Prepac Oak Platform Bed Frame provides exactly that. The Prepac Oak Platform Bed Frame has a solid wooden base with a larger wooden flat piece on top that features raised edges to keep your mattress in place when you sleep at night. The frame itself is rather attractive and there are even more wooden options offered by Prepac for those who have different decorative needs. This frame is rather simple both in design and construction and those who purchase it should have no problem putting it together. The reviews for this frame are fairly good with only a few minor complaints. The most complaint is that the wood is prone to splitting if you are not careful when you are putting it together. Luckily, this is something that you should take into consideration rather than a design flaw or malfunction with the frame itself. The simplicity and ease-of-use of the Prepac Oak Platform makes it a great option for anyone who wants a solid support system without having to worry about their mattress sagging or having to deal with a difficult assembly process. The Zinus Smart.Bed Adjustable Bed Frame is the way to go for those who want to be able to adjust their bed to any angle they may need. This frame is fully motorized and offers a wireless remote to control the movements of the bed. The bed is capable of moving upward individually for both the head and the feet sections and is also capable of raising itself in both sections at the same time. The remote itself can store your favorite setting using its memory feature and comes with backlit buttons so that you can adjust your settings at any time during the night. Since this bed frame is electronic, it does have some disadvantages. Speaking to the quality of the bed frame itself, it is said to be very sturdy and perform exactly as advertised. The only issue that comes with using the Zinus Smart.Bed Adjustable Bed Frame is that there are some instances in which the moment will fail. This tends to happen shortly after purchasing the product and you will know almost immediately if your product is faulty or not. It can be difficult to sit up in a regular bed and read or watch a movie. If you’re someone who loves comfort and would like to be able to prop yourself up at the push of the button, look into the Zinus Smart.Bed Adjustable Bed Frame. This frame has no slats, so would be a good choice if that’s what you’re looking for. The first and most obvious choice of bed frame to use with you Casper mattress is the Casper Sleep Bed Frame. It should be stated that this is the best frame to purchase for the Casper mattress due to the fact that it was designed by the same company. However, it is not necessarily the best Casper compatible frame on the market. The Casper Sleep Bed Frame is a simple metal frame with six legs and a headboard bracket that is easy to assemble without the need for tools or individual pieces. All you need to do to get your Casper Sleep Bed Frame ready to use is to slide the matching sections into each other and set it up in place. There’s not many additional features or special aspects of the Casper Sleep Bed Frame so the review section for this product will be rather short. While the Casper Sleep Bed Frame does function as advertised, some users have expressed their disappointment in the product. The biggest issues with this product are the cost of it, as many users argue that the price is too high for a frame that works adequately rather than superbly, and the lack of protection in the packaging, as many individuals who purchased this product received their bed frame in a damaged condition. That being said, this bed frame was designed with the Casper Sleep Bed Frame in mind and does function to support the bed. 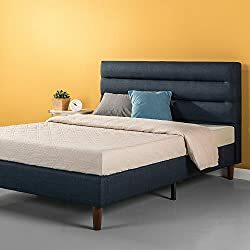 If you are looking for a bed frame that does the job and you want the complete Casper product line, you will probably be happy with purchasing the Casper Sleep Bed Frame. It also would work well with the Leesa, too. The bed frame that you choose to purchase is just as important as the mattress that you put on top of it. If you aren’t sure what you need to be looking for when you are purchasing a bed frame for your mattress, here is a short guide that will give you a better idea of some of the main features that your bed frame needs. Although some bed frames will advertise themselves as being made for a specific size of bed, bed frames do not always fit all sizes and you may end up with a bed frame that is too large for your mattress if you do not double-check the measurements before you purchase it. Make sure that you heavily research your desired bed frame and compare it to the mattress that you currently own to avoid getting a frame that doesn’t work with your bed. There’s nothing worse than purchasing a frame and then having your mattress move around during the night. The type of material doesn’t necessarily matter when it comes to the quality of your bed frame. Wooden bed frames tend to be just as secure as metal bed frames and sometimes metal bed frames can be poorly constructed too, causing just as many issues as you would get out of a problematic wooden frame. That being said, metal does tend to be sturdier than wood and will also last longer. If you need aesthetic as well, try looking for a frame that has a combination of wood and metal. You could always purchase a bed frame that simply supports your bed and allows you to sleep or you could purchase a bed frame that gives you a vast array of features to get even more out of the space in your room. For example, you may want to choose a bed with drawers located at the bottom if you have excess clothing stored around your room. If you’re someone who loves to read, you may want to get yourself a bed frame that can lift your bed up so that way you don’t have to shift around constantly to find a comfortable position. Maybe you might want to add a headboard to the back of your bed someday. Bed frames come with plenty of features and it is up to you to decide what you might need. Height isn’t something that you typically consider until after you’ve purchased your frame and realize that it is too tall or too short. You don’t want to be climbing into a bed that is at ankle height if you have trouble bending over. Similarly, it can be difficult to get onto a bed that is too high as well. Height is also something that you may want to consider if you need the extra storage space. The area under the bed is perfect to store items that you may need quick access to. However, you can always get a shorter bed if you do not require any additional storage space. Take these things into consideration before you buy a bed frame of a certain height. Luxury bed frames are often amazing to look at but the better-looking bed frames also tend to take the most time to set up. A couple of hours of assembly here or there doesn’t sound like much until you start actually having to set up your bed frame. Some bed frames may even require you to use special tools that you may have to go out and buy just to put your bed frame together. If assembly isn’t a big issue you for you, you have an unlimited number of bed frames to choose from. If you would prefer to not spend hours putting together a frame, be careful when you are looking for one and check out the assembly time beforehand. On that note, it is also important that you think about how easy it will be to move around or to disassemble should you have to do it in the near future. Then, you will have to go through that process just to reassemble it again. The Casper mattress is a specially-designed mattress constructed from four different types of bed memory foam: comfort foam to support your body and keep the body cool at night, memory foam for support as well as for comfort, transition foam to help distribute your weight evenly, and support foam at the base that keeps you from sinking through the other three layers of foam. Since many Casper buyers are on a budget, Zinus mattresses are very popular. IKEA offers many bed frames that can go well with a Casper. I personally used the Malm with my Casper and it was great! Casper offers a metal bed frame, though it doesn’t appear to be that popular. The Casper mattress is an excellent mattress and it deserves a bed frame that can support it and enhance the overall sleep experience. Hopefully, this short guide has given you a better idea of what you need to look for and some fo the options that you are able to purchase. Remember, the most important thing is that your frame and your mattress supports you.